When I found out I was pregnant, the photographer in me was bursting with excitement over all the ways I could capture our little one. Throughout my pregnancy I pinned cute newborn posing ideas on Pinterest and browsed Etsy for fun newborn hats and accessories for pictures. My husband and I decided this baby would be our last, which added pressure to be prepared so I wouldn’t miss a thing! In fact, (don’t judge me for being crazy obsessed) I was actually taking pictures from my hospital bed within hours after the delivery of my baby! 1. Prepare while you are pregnant. You want to gather props (i.e. 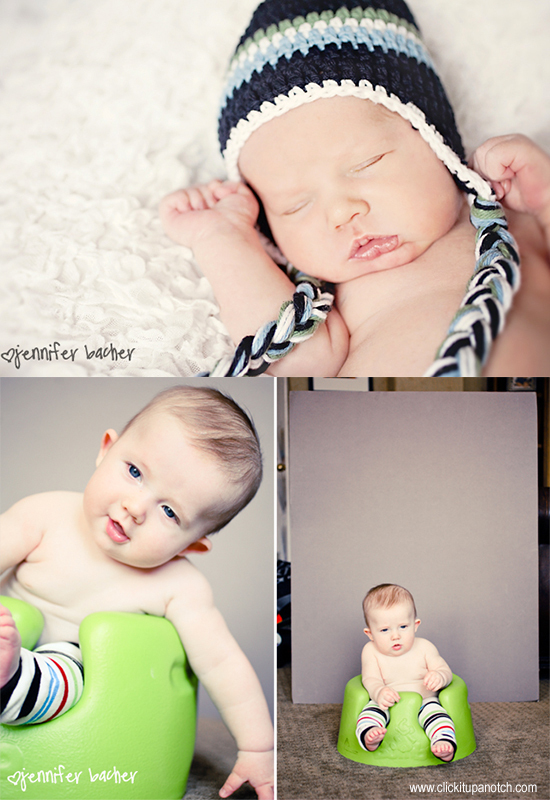 baskets or blankets), clothing, or accessories you want to use to photograph your baby. Mentally prepare yourself with the look you are going for and what you will need to achieve it. Remember, do this before you have the baby. You will not have the time or energy to run around to stores looking for things as a new mom! This crocheted hat spoke to me when I saw it on Etsy. This was one of the first pictures I took of my little guy after I brought him home. Also while pregnant, if you plan to send out a baby announcement, start thinking about what kind you want. If there’s a certain pose, angle, or colors that will look best with a particular announcement, you will want to consider this in your planning. I saw this pose on the web and knew I had to try it since I had four kiddos. I used this photo on my baby’s birth announcement. 2. 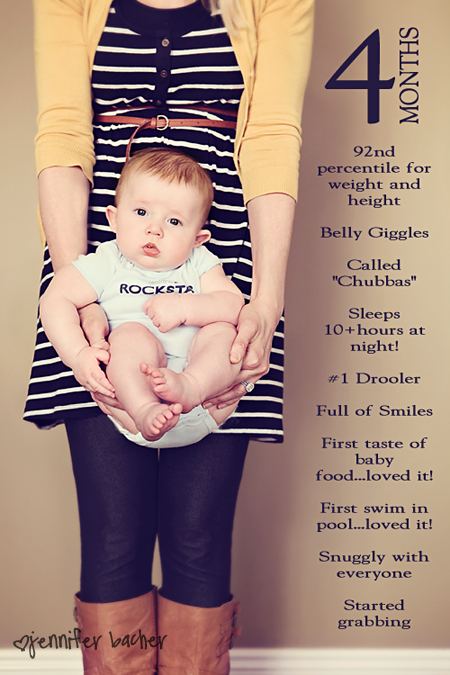 Recruit an assistant for your newborn “session” at home. I did one formal session at my home with props and careful posing when my baby was about a week old. You will need someone to hold a reflector, pull the binky out of baby’s mouth, wipe spit up, fix baby’s positioning while you hold the camera, etc. Trust me, you cannot do all this alone! My 8 and 11-year-old daughters were my helpers. 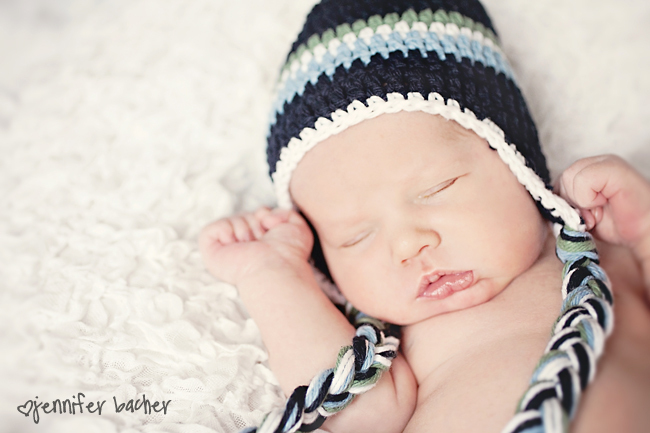 Note: newborn sessions should typically be done when baby is 1-2 weeks old if you want those sleepy newborn shots! 3. Don’t worry about always getting the perfectly posed shot or you will miss the “real” moments! Keep that camera handy and use it anytime your heart speaks to you. Capture the magic of all those special relationships. One morning I had my baby in my bed lying naked with only a diaper on. My five-year-old son came in and wanted to take his shirt off too. Then he climbed into bed and snuggled with his baby brother. Seeing them lying there together was too precious not to capture! And don’t forget the details that tell a story. 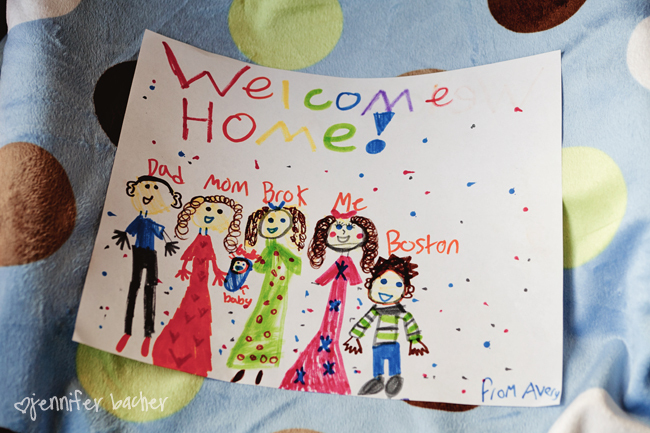 This cute drawing by my daughter was waiting in baby’s bed when we came home from the hospital. 4. Capture all the “firsts” and milestones. Remember to grab your camera when your baby does something new. First bath, first smiles & giggles, first time eating food, sitting up, crawling, etc. And don’t forget about the video camera. We tend to take less video footage because I do so many still shots. There’s certain things that are better captured in video…like my fav, baby’s first giggles. 5. Remember to photograph MOMMY and DADDY with baby too! Grab a friend/family member to take some shots or set up a tripod and use your self-timer or interval shooting. 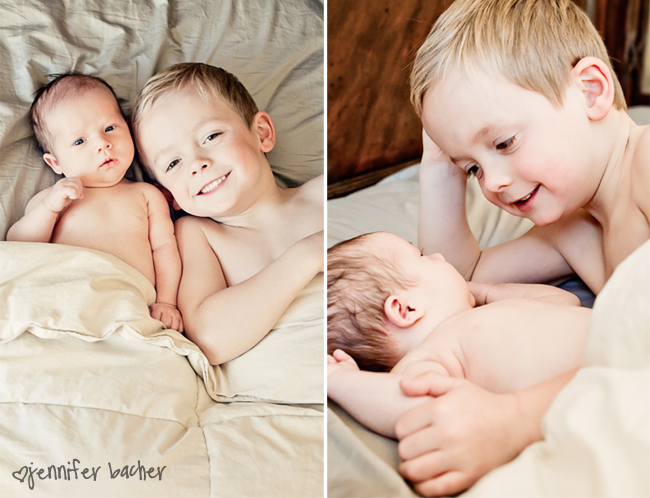 You will love these images when your baby gets older I promise! We had a photographer (Bella Baby Photography) take some pictures of my husband and I with the baby at the hospital. I will treasure these forever. I also love looking back at old photos of what my mother looked like when I was born. Your child will love seeing what you looked like when he/she was born. 6. Use your phone camera if your nice one isn’t handy. I usually have my phone sitting next to me in case someone tries to call while I am nursing or otherwise occupied. Often times I want to freeze a special moment and the camera phone is better than nothing! A few weeks ago I had my baby snuggled in my arms while he was sleeping. I didn’t want to put him down. I could have stayed like that all day! I grabbed my phone and snapped a quick one. FYI- There’s apps out there that let you do minor editing on your phone like I did on here. A couple of my favorites are Camera+ and Instagram. Camera+ lets you change the white balance, crop, add creative processing and add borders. These apps are fun to play around with before you post your mobile pictures to facebook or the web. 7. Schedule your baby’s “sessions” every month on your calendar. 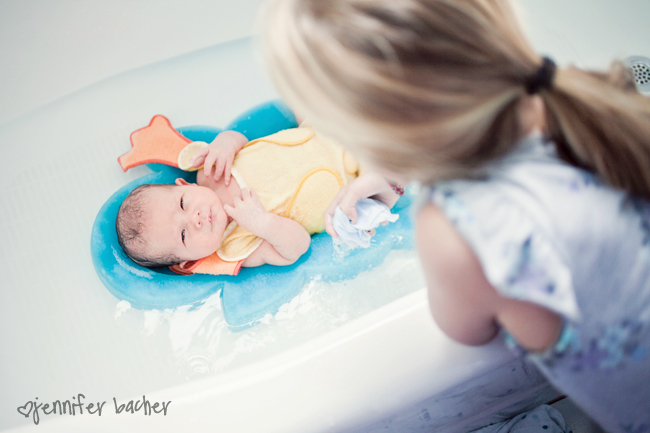 Make photographing your baby a part of your monthly routine. As a tired new mom, if you don’t plan ahead, you most likely won’t get it done! I like to do a little shoot each month on the 11th, since that is the day my babe was born. Another idea I saw on Pinterest and have been doing with my baby… I take a picture each month of him wearing a white onesie, laying on the same white blanket. I printed up some stickers that have each month printed on them that I stick to the front of his onesie. I will do a wall display/collage of the whole year when he turns one to see how he’s changed. 8. Set your aperture low for those creamy soft backgrounds. For example, f/2.8 and use a good portrait lens, not a wide angle, which can distort. You don’t want baby’s head or feet to appear larger than normal. Recommended focal lengths for photographing babies are 50mm and 85mm. Also, the 100mm macro is great for close up details like fingers and eyelashes. 9. Keep it simple and cheap! You don’t need elaborate backdrops or expensive lighting equipment. Babies look best when photographed in soft, natural light. Use reflectors to get catch lights in their eyes or to fill in shadows. Use a plain painted wall or a piece of bead board as a backdrop. Or my favorite, an inexpensive piece of mat board from a frame shop as your background. I have these in many colors and they come in handy a lot! Here’s a pulled back shot of my mat board setup the other day. One of the greatest gifts as a photographer is being able to capture precious images of your own children. 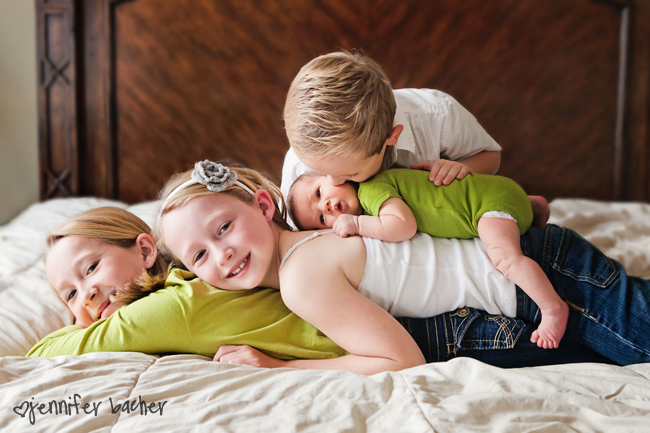 Take advantage of your talent and bless your family with your heart-felt images of your little one! But this was a great article, definitely gave me a little reminder since having my first child 4 years ago (suprise to us!) and then the things I actually want to PLAN as we prepared to conceive another one. Thank you for your wonderful posts! This one had great ideas! Wondering how to get the text on the photo in #7? Thanks for these great tips! I a, hoping for one kore baby and look forward to using them. Especially love the idea of using a mat board for a simple background. Thanks for these great tips. I wish I’d planned more ahead of time with my last one. He just turned 5 months old and he’ll be our last. The time is flying by so fast that I just want to make it stop just for a little while. Like all busy mommas, finding the time to photograph him as I really should is hard, but this post has really inspired me to make more of an effort. I’ll never be able to go back to this time in his life, but I can at least be reminded of these precious moments through the photographs. Great post, thanks for sharing! I wish I had read this when my kids were babies. My question is, how do you get such great lighting all around your house (in your bed with the boys, in the bathtub etc)? Your pictures don’t look grainy at all and when I am trying to do something in my house like this I have to bump my ISO way up and they always turn out grainy and sometimes ISO at it’s highest is still dark. Thanks! I have certain areas of my house that get great light at certain times of the day. My bedroom for example has a huge sliding door right by my bed. I shoot in the mornings in my bedroom since those windows get morning sun. Open up your shades and curtains completely when you take pictures. And open up every window shade in the room, even the ones across the room. Any available light you can add is great. Watch throughout the day what areas of your home get good light and what time, then plan your shots at those times. I also use my speedlight flash sometimes at night by bouncing the flash off the ceiling or white walls. I was wondering what you plan to do with your baby’s photos – are you going to create a photo book or are you printing them and putting into a scrapbook? I can’t seem to decide and I have so many! Would love to know your thoughts. Sorry I am just now responding to you! Baby= limited computer time! Anyways, I am planning to put my images in a photo book. Sadly, I don’t scrapbook anymore since it is too time consuming. 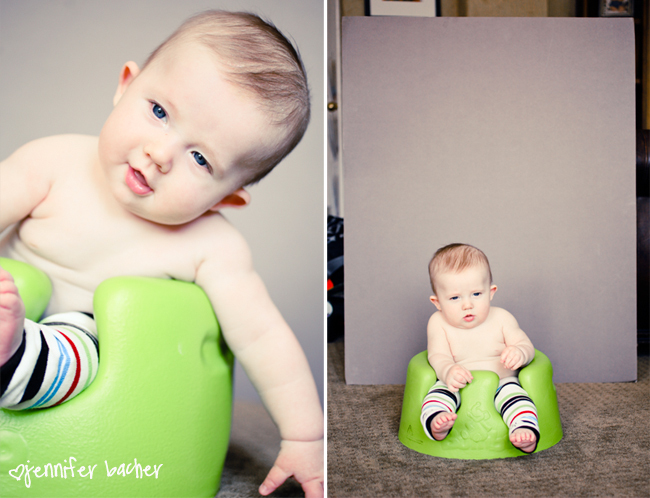 I plan on creating a photo book of my baby’s first year using a month to month format. I will probably do 2-4 pages of photos per month in age. I plan to highlight my favorite images (or use the ones with him in his white onesies/sticker) by printing them big using a full page in the book. I would only use your images you are most proud of or that truly capture the different stages well for your book. I usually print up the other snapshots as 4×6’s (the ones I don’t use in a nice printed book) and put them in a photo album…the kind with the sectioned plastic pages. I like to have my photos printed up in case something were to happy to my digital copies. Thanks Jennifer, that’s a good idea to just put the good photos in the photobook – it would be one huge photobook otherwise!!! Wonderful post! Love the tips, they’ll surely be helpful! Great tips! I love the tip #7 ideas and photos, especially the one with the stats down the side. That is a brilliant idea just like the pregnancy ones Courtney does on here. Thank you for your tips. I totally agree that planning while pregnant is essential. Once the baby comes, there is NO time! Thank you for the tips! My baby girl is 10 months old and I have so many pictures! She changes so much everyday!! Hi there! Just curious what Etsy shop you purchased the adorable crocheted hat for in #1? Here’s the link to shop. I was very impressed! These pictures are bueitufal. by far better than anne geddes. I am so very happy for you and scott. a baby is the most bueitufal thing i am glad that god has given you the opportunity to experience motherhood.. I love these ideas. I am interested in replicating the one you did for idea #7, Schedule a session. Do you have a template you can post? What was the format where you had writing on the right side? Thanks! I’m so sorry, I didn’t use a template. I just used the text tool in photoshop to write down the side of the photo. Check out comment #4 above by Courtney, where she gives more suggestions on how to add writing to your photos. Just found your blog and I’m loving it! I just had my first baby three months ago-wish I had found these tips a little earlier though . . . oh well! Never too late to put your tips to good use! One question off the subject, where did you get you dress in the four month picture? It is so cute! You are going to die…Target (last year…sorry)! Funny, this picture was posted on a fashion blog alongside all these high fashion images. I was dying. If only they knew I paid $20 for that dress…ha ha! Great blog Jennifer, I’m having my baby in a month and this gives me great ideas, I have one question, where did you get the baby bath tub in #4?, I just love it and haven’t seen anything like it, would be really helpful if I could find something like that. has any particular name or brand? I love your tips and helpful ideas. I can’t figure out how to resize my photos so I can add a border and they will look great in a 5×7 or 8×10 when it is printed. The borders are always cut off. Thanks in advance for any help you can give. I love the photo with the stats on it. Did you do that each month?! Have you posted all of them? Sorry for the last response. Just noticed your comment! I did the photo with the stats about every 3 months. I will post them all this month on my blog at some point since my baby is turning one. Thanks for posting this! I needed to hear tip 10 tonight – it is so easy to go from ‘searching for inspiration’ to ‘I’ll never be THAT good.’ so thanks for the reminder of what is important! Great post! I’m wondering if you have any tips on selecting, or choosing fabrics for baby photography? What’s a good fabric that won’t irritate a newborn’s skin? Aden & Anais swaddle blankets are my favorite for photographing newborns. I like solid colors or a very subtle print so it doesn’t distract from the baby. I like to be able to swaddle them tight so you can see how small they are, so a thin blanket usually works best. 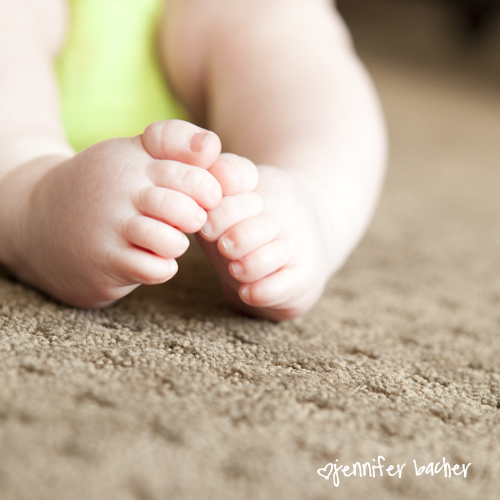 I love chenille for newborns or anything cotton should be fine for their skin. Your blog is excellent. I really appreciate the tips. I am wondering though how to use a reflector. Do I need one for my in home pictur taking? Sorry for the late response! Reflectors come in handy when you need to reflect light into shadowed areas. I use mine in my home when I need to fill shadows while shooting food, as well as in backlight (windows behind subject) to reflect light back into my subject’s faces when the main window light is behind them. They are nice when you just need a little boost of light. muy buenas acabo signifiant enterarme delaware tu world wide web ymca la verdad ations cual me personally parece friendly zero sabia delaware mas personas interesadas durante estos temas, aqui tienes n’t nuevo lector qui seguira visitandote abitualmente. Great great tips! Thank you so much! Something I’ll have to keep in mind in a few years when we expect another baby again. Great suggestions and absolutely love the ‘4 months’ pic idea, summarizing ‘the firsts’. Also enjoyed the family pics. Beautiful work! the web I found this web site as a best site for hottest updates. 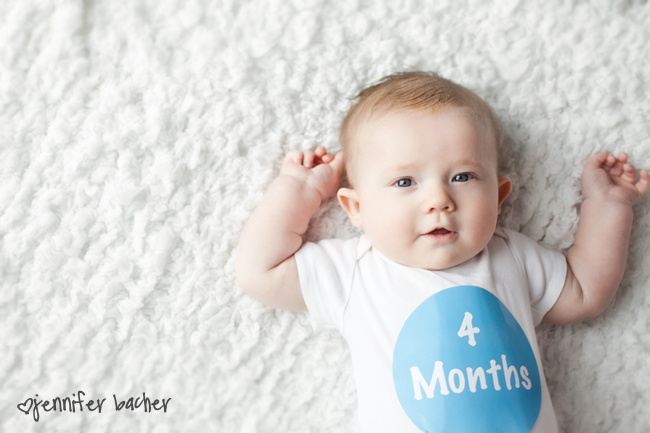 How did you create the photo with the 4 month old and the milestones? Is there an app you can use to do that? I used 8.5×11 sheets that are stickers (you can get them at office supply stores) then designed them in Photoshop and printed them up. I cut out each circle out with the scissors, peeled off the back and stuck it to his onesie. Super easy! Howdy, You have done a wonderful job. I’m going to definitely reddit them along with independently highly recommend to my local freinds. I am comfortable they’re going to be took advantage of this web site. I’m doing a newborn session tomorrow for my nephew’s new baby and am excited/nervous. Your tips are wonderful and I really love what you said at the very end – “Shoot from the heart and don’t worry about what other photographers are doing. Your images will speak to you if you let intuition guide you.” I think those words are wonderful advice for any photographer getting his/her feet wet in any aspect of the field. I needed to hear this tonight. Thank you. So for my birthday recently he bought me a fancy camera so I could do all my own shots. It has been fun but I am very inexperienced and not sure how to use this camera to the best of it’s ability. So #8 was helpful. I hope to figure it out soon so I can do her 6 month photos myself. Hi! I just found your blog and absolutely love it. I am a very amateur photographer and just gave birth (1 week ago) and want to photograph my newborn. I have a Cannon Rebel t3i, lens kit and a 50mm 1.8 lens. After reading most of your post (so thankful for the info you share) I have one question: is there a way to get creamy smooth skin tones without having to edit in computer afterwards? Thank you so much for your posts and answer. Photographing your baby can be a challenge when you are sleep deprived and exhausted. I appreciate your creativity which you have used in this beautiful photograph. All photographs are very attractive, Your views are also nice. This is an awesome write-up! Thank you. I don’t have a kid and unmarried but I really would love to do this too. I’m definitely into photographing little ones.